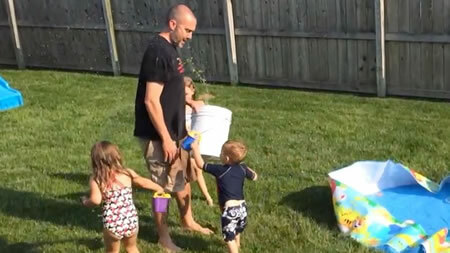 I can think of no better way to wrap up the Summer of Tim than with a good old-fashioned backyard water fight. What started as a simple effort to corral the kids for dinner quickly escalated. I won't say who instigated it, but the culprit was not born in the 21st century. Sixty days. Sixty days gone by much too quickly. The Summer of Tim concludes as I head back to work tomorrow for the start of a new school year. Looks like it was great one! Until next year....once more unto the breach! Ah... I can die now. Day 58: Cool water. Cool beer. Cool neighbors. Day 57: Must be my lucky day.